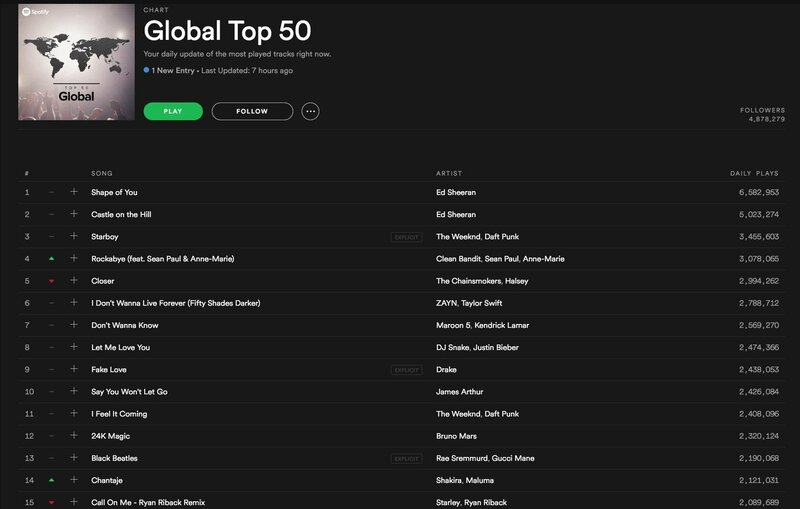 Ed Sheeran is the most-streamed artist on Spotify in the world right now – and holds both No.1 and No.2 on the platform’s official global chart. The British singer/songwriter released not one but two comeback singles on Friday (January 6): the U2/Killers-indebted Castle On The Hill and rhythmic pop effort Shape Of You. In their first two days on Spotify (up to end of Saturday, Jan 7), the two tracks have racked up over 23m streams between them. That’s around half a million plays every hour. Shape Of You is slightly out in front with 12.71m cumulative streams, while Castle On The Hill has attracted 10.65m plays – a total of 23.36m. Judging by Spotify’s previously stated (since deleted) average per -stream payout to music rightsholders of $0.007, that means the two songs have already generated somewhere in the region of $161,000 for Sheeran and industry team. Shape Of You is showing signs of being the bigger hit of the two. The track added 6.58m Spotify streams yesterday, up 458,797 on the previous day. Castle On The Hill added 5.02m yesterday – down 608,002 on release day. The good news for camp Sheeran doesn’t end there. 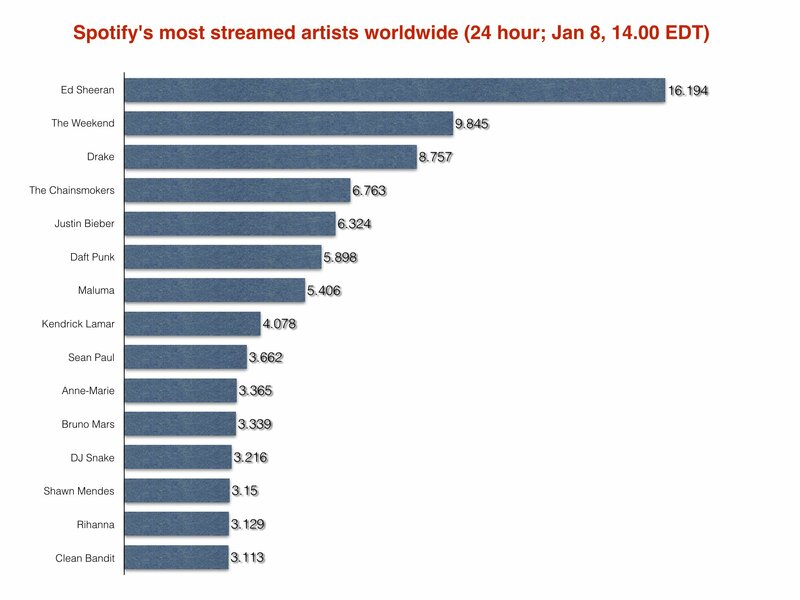 According to official Spotify stats (via Kworb), the singer/songwriter is the most-streamed artist on the service over the past 24 hours, with 16.19m daily plays. That’s almost a full third ahead of The Weekend in second spot (9.85m) and Drake at No.3 (8.76m). As you can see below, Sheeran isn’t the only British artist in the Top 10: his label-mate at Atlantic UK, Anne-Marie, is ahead of any other British artist at No.10 (3.37m). Her collaborators on UK No.1 hit Rockabye, Clean Bandit – another Atlantic UK act – are at No.15 with 3.11m streams, ahead of luminaries such as Twenty One Pilots and Calvin Harris. Spotify is heavily promoting Sheeran’s comeback – especially through its own ‘This Is: Ed Sheeran’ playlist (pictured, main), which currently has just over 324,000 followers. Spotify even appears to be actively pushing this playlist to Premium users. 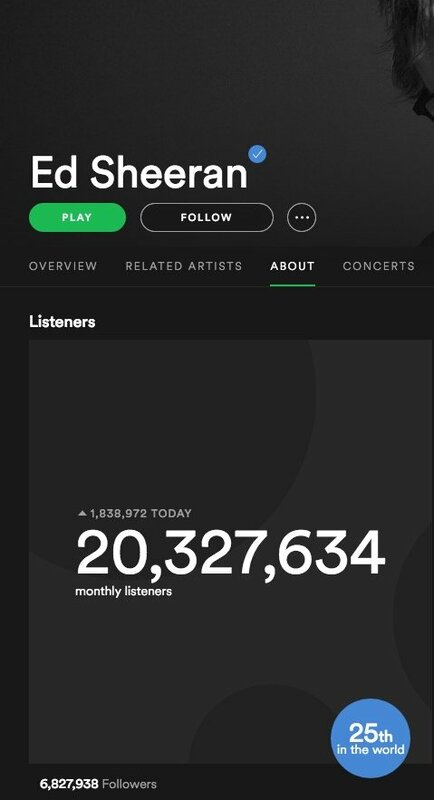 In terms of global monthly listeners (which update each day on a rolling basis), Ed Sheeran is currently at No.25 on Spotify with 20.33m. He still has a fair way to go to catch the artist with the most global listeners today – The Weeknd with 39.48m. However, yesterday alone Sheeran added 1.84m within 24 hours. Meanwhile, according to the UK’s Official Charts Company, Sheeran’s duo of tracks are way out in front in the market’s early midweek sales flash. Shape Of You leads at No.1 with 83,000 chart ‘sales’ (including streams converted to ‘sales’ at a ratio of 150:1) after two days of availability. Castle On The Hill trails closely in second place.